Enjoy all the taste of pumpkin pie for breakfast – without the sugar and calories. It takes only five minutes to whip up this naturally sweetened, gluten-free and vegan chia pumpkin pudding! 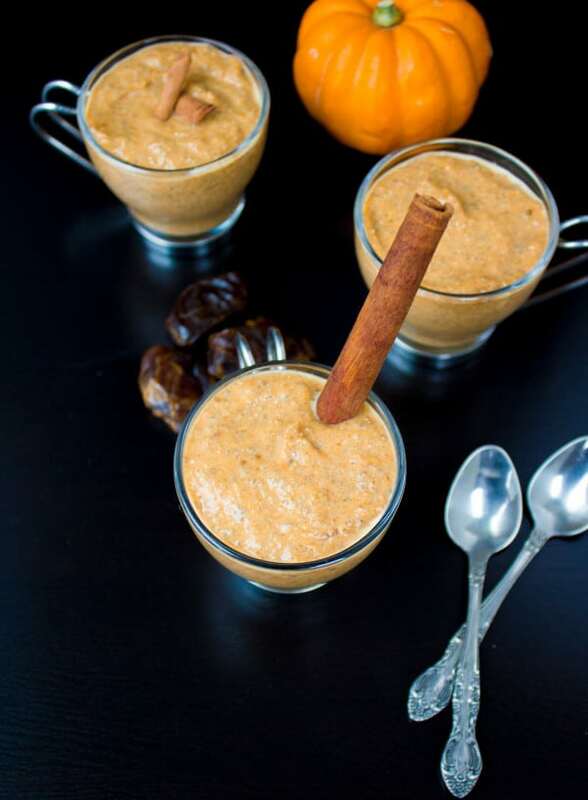 This instant chia pumpkin pudding recipe is a speedy sweet treat that will satisfy your pumpkin craving with absolutely no guilt. 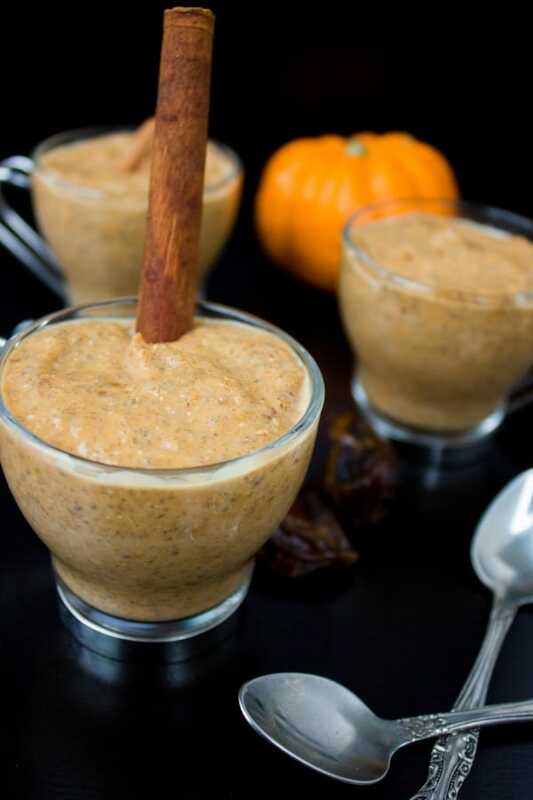 Chia seeds, pumpkin, dates and almond milk are blended to make this creamy, sweet pumpkin pudding. Season it with pumpkin spice if you like, or sweeten it with maple syrup for an earthy maple flavor. A long while ago I made this instant chia chocolate pudding—which I go back to whenever I need a guilt-free chocolate fix, or when anyone counting their calories visits. It’s pure chocolate goodness, vegan and gluten-free, thick and creamy pudding. So this instant chia pumpkin pudding is just a seasonal version of it. I tasted a version of a chia pumpkin pudding a few months ago, and that’s how this recipe came into action. That version had maple syrup, and I could taste that beautiful earthy flavor which perfectly compliments the pumpkin. And that original one I tasted had whole chia seeds in them which means the chia seeds have been soaked in the milk for a while and were not blended. So while I loved it, I felt I needed to tweak things around. These pumpkin puddings taste just like pumpkin pie filling but are absolutely guilt-free! The perfect way to get your share of pumpkin spice deliciousness without having to overdose on sugary coffee shop beverages.
. I found the only downfall to using dates is, that they add a little brown to the bright orange pumpkin pudding. Then added a bit of fall magic with a dash of pumpkin spice and an extra dash of cinnamon—because that’s just a preference. If you’re in love with pumpkin spice this season or chai spice, add away! For pure pumpkin flavour, just leave them out. Chia seeds are one of those superfoods you should really try to get more of, and they have the wonderful characteristic of thickening up instantly upon blending or soaking. I wrote a bit more about them in this instant chia chocolate pudding recipe. Now if you don’t care about what’s healthy these days and what’s not—just think of them as thickeners to give you that “instant” pudding effect – no waiting around or chilling time. 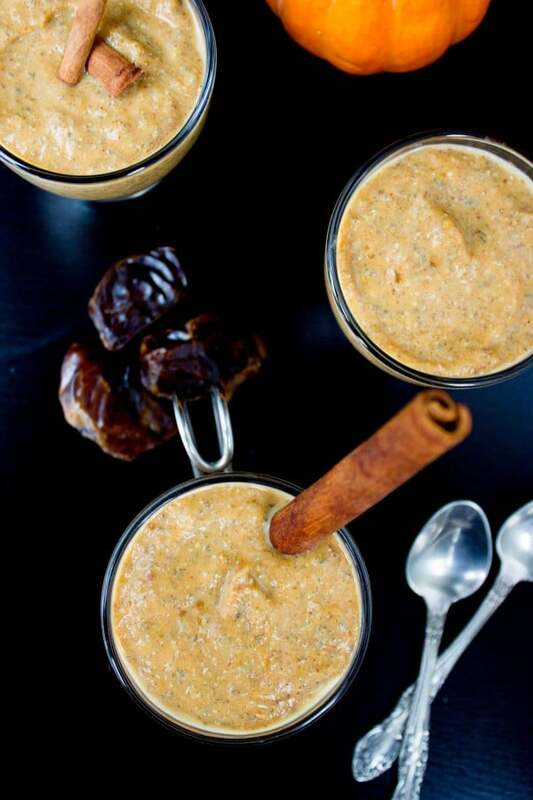 For making a batch of Instant Pumpkin Chia Pudding, simply combine dates, pumpkin puree, almond milk, chia seeds and spices in a high-speed blender and pulse until the mixture thickens naturally. They are good to eat right away but you can also pour the pudding into dessert glasses and store them in the fridge. The instant chia pudding can be made using any type of milk you prefer. Feel free to add more or fewer spices to your pumpkin pudding to adjust them to your taste. You can use maple syrup instead of dates, or if you’re not vegan, even honey! Enjoy all the taste of pumpkin pie for breakfast - without the sugar and calories. 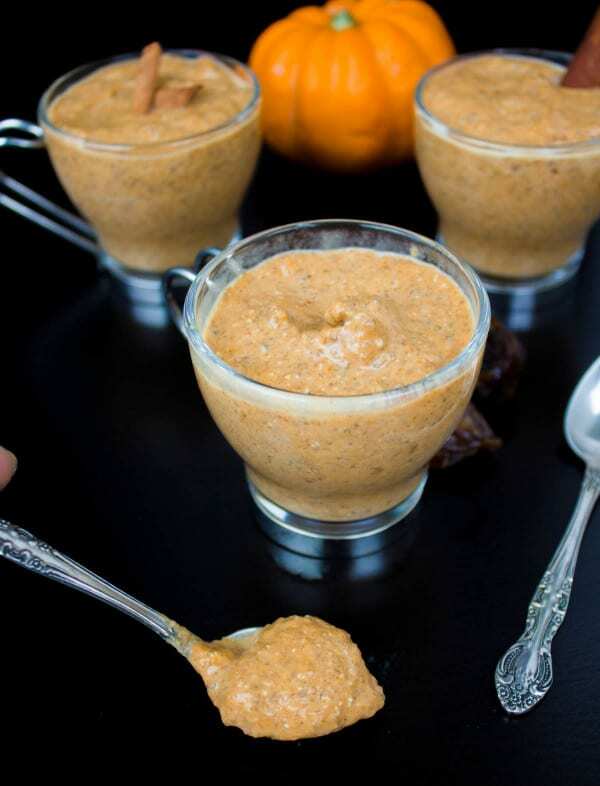 It takes only five minutes to whip up this naturally sweetened, gluten-free and vegan pumpkin pie chia pudding! In a blender, add all ingredients and blend well. Serve. You can use maple syrup instead of dates, or if you're not vegan, even honey! this looks delicious and just shouts fall. 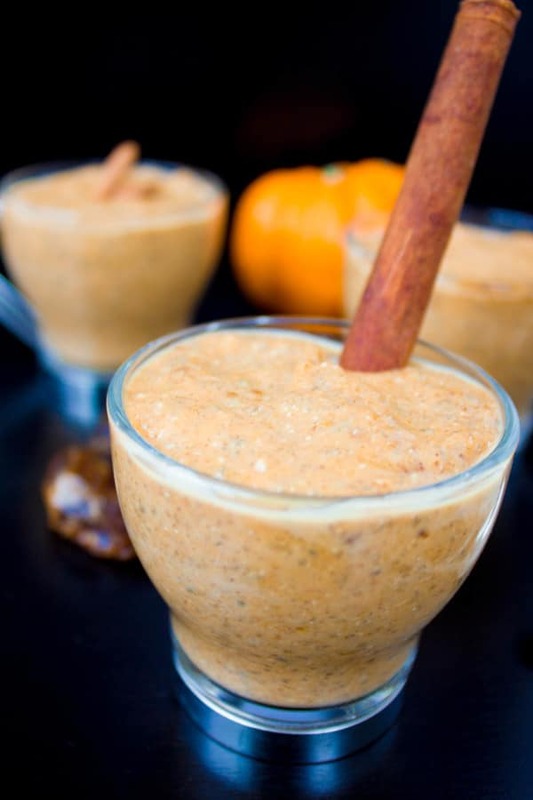 I love pumpkin pudding and this one with the chia sounds perfect! Hope you make it soon! I have just gotten into throwing chia seeds into everything. I just some dates and I’m going to make this delicious recipe! Such healthy, delicious and easy to make dessert. This is so perfect for this time of the year – guilt free dessert to enjoy the fall weather. hmmm this looks so delicious, all the cinnamon sprinkled throughout. that’s a cute serving idea, too, with the cinnamon sticks! Thanks Noel! Hope you enjoy it! Mmmm….this pumpkin pudding looks so darn delicious! It’s exactly what I need in my life right now. Yum! Denay, hope you make it soon!! Pumpkin chia pudding is really so good !! Oh, I just made chia pudding with pumpkin puree over the weekend was so good. Such a perfect fall treat. 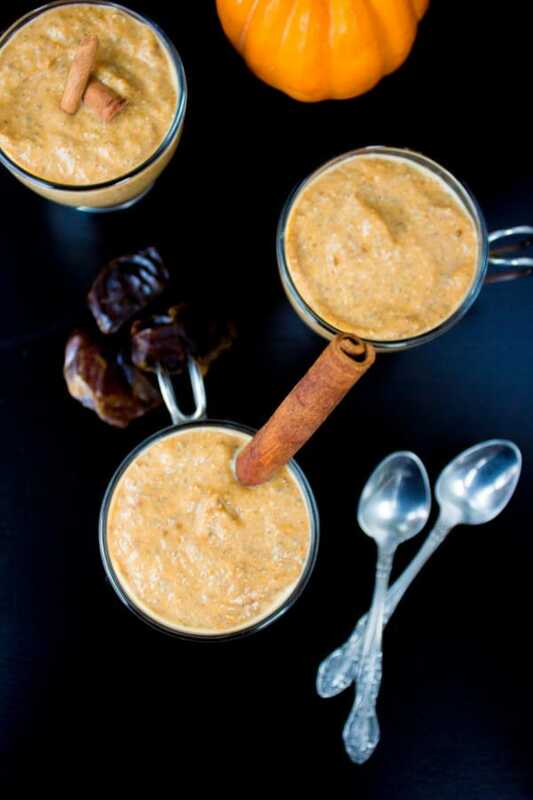 Love the flavor of dates with pumpkin puree. This sounds yum. I must try it soon. What a wonderful Fall dessert! 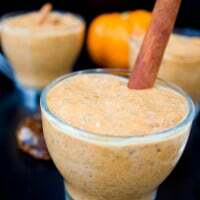 I love pumpkin and making it into a treat that is good for me too would be fabulous. Using the dates as a sweetener is a fantastic idea! I’m pinning and making this soon. Hope you enjoy it Marisa! Oh goodness, this pudding looks absolutely amazing. 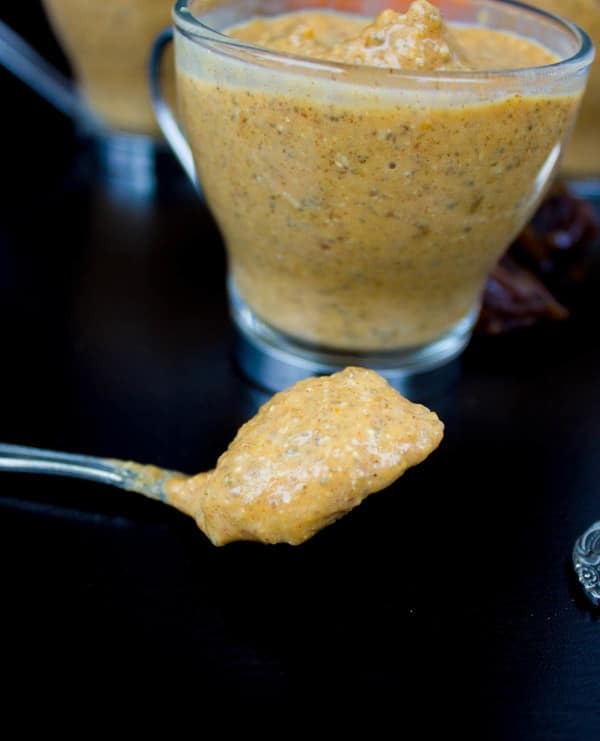 I love pumpkin flavors this time of year and I love that this recipe is dairy free. Thank you! 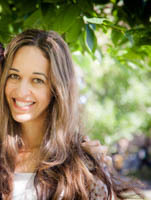 Hi Joetta, I would say a week in the fridge!! What a great fall flavor combination. I love all these things by them selfs so, it’s a safe bet I’m going to love this recipe.